Chances are, if you consider yourself a reader, you probably have a favorite author. I actually have a few favorites — and one of them is J.R.R. Tolkien. Now, you might be wondering how Tolkien fits in to a travel blog. And it's a valid question. I would argue, though, that Tolkien is not only relevant to my blog, but also a PART of it. 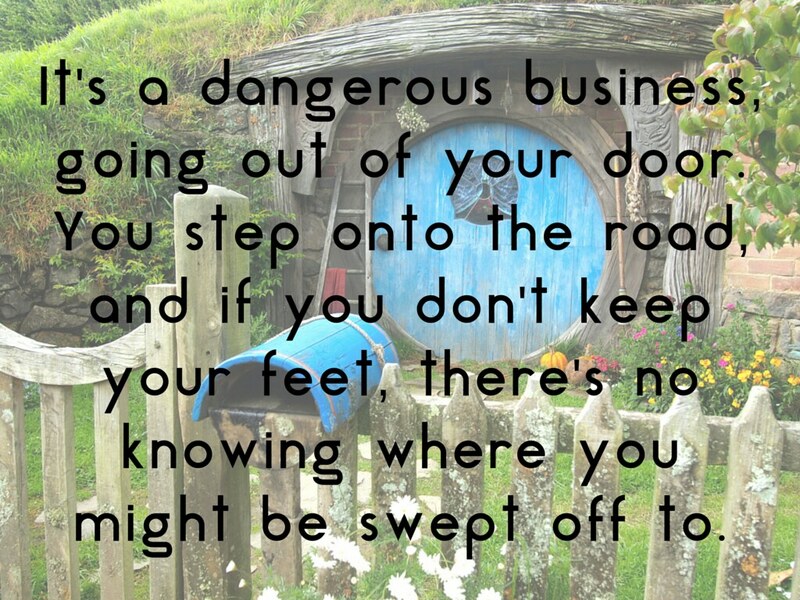 The very name of my blog — A Dangerous Business — comes from a Tolkien quote, and I often think back to memorable lines when I'm out exploring the world. 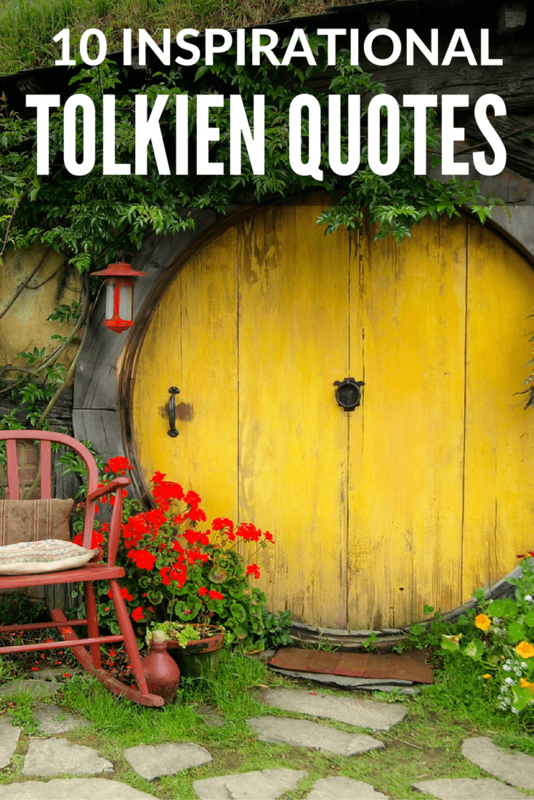 Even though I'm sure the Professor would hate to see a list of “inspirational Tolkien quotes” on the Internet, too bad — that's exactly what you're getting below. I have this quote tattooed (in Elvish, of course) around my wrist; a constant reminder that, even if I'm not happy with a situation I'm in, the only thing to do is make the best of it. Whether it's a bumpy, sweltering, nausea-inducing bus ride, or a business deal that falls through, I try my best to always look on the bright side. When you travel as often as I do, you learn quickly that things NEVER go as planned. You can either choose to throw a tantrum and let a setback ruin your whole trip, OR you can just accept what's been given to you and make the best of it. I definitely choose the latter — because life is way too short to sweat the small, stupid stuff. Truer words have never been spoken. Just think how much less stress we'd all face if we measured success in the number of hours spent enjoying good food and the company of close friends rather than the number of dollars in our bank accounts. If I close my eyes and listen to this quote spoken, I'm immediately swept away. It's the quote that inspired the name of this website, and I still love it after all these years. Travel works exactly this way if you let it — you head off on an adventure expecting to experience the world in a certain way. And then of course you throw your plans out the window, meet new people, and fall in love with places you never expected to. As soon as you let your feet stray from the path, travel really CAN sweep you away to the most incredible places. I get this question a lot: Aren't you afraid to travel alone? From people who assume that the world “out there” is inherently dangerous. And sure, there are corners of the globe that I probably wouldn't venture to right now. But for every truly “dangerous” place out there, there are 5 or 10 others the are beautiful and perfectly safe. The world is not divided into good and bad — and that's part of what makes it so interesting. Some people assume that people who travel a lot are running away from something — from a bad relationship, from job troubles, because they never want to grow up… But this definitely isn't always the case. In fact, I would argue that traveling has lead me to discover more about myself and the world and the human condition than anything else I've done in life. I may wander a lot — but I'm certainly not lost. To all the people out there who are scared of others based on their religion or race or where they were born: get over it. The world is in a constant state of flux and is getting smaller every year thanks to technology. This quote is so true — eventually the scary, dangerous world “out there” will reach you, no matter how much you try to keep it out. So you may as well embrace it now. I view this one as a variation on another famous quote: “A journey of a thousand miles begins with a single step.” You don't have to spend 10 months circumnavigating the world in order to be a traveler. You first trip doesn't have to be a solo jaunt to the heart of Africa. Travel on your own terms and within your own comfort levels. Over time, you'll become more confident, and those baby steps will turn into longer strides. Oh how true this is. When you travel, you often arrive in a new destination with expectations. Sometimes you're certain you're going to love a place, while other times you're a bit more skeptical. And, inevitably, you are almost always surprised. You are only quite a little fellow in a wide world after all! The more of the world I see, the more I realize how little of it I've seen. There are so many places to visit and customs to learn about and foods to eat — my bucket list has this funny talent of getting longer instead of shorter. The longer I travel, the more I realize that I'll never be able to go everywhere or see everything. Realizing just how BIG the world is makes me realize how small I am. But that's okay. I'm just a tiny speck in the Universe, after all, and traveling helps keep me grounded on this. Don't adventures ever have an end? I suppose not. Someone else always has to carry on on the story. Once you start traveling — once you get bitten by the travel bug — it's very difficult to stop. Once your eyes have seen foreign lands and been opened to different ways of thinking, a part of you will always yearn to GO. For a traveler, the adventures definitely never end — we're always looking ahead to the next one. Which quote is your favorite? Which one can you relate to the most? This is such a clever and inspired post. I’ve always loved “Not all those who wander are lost” perhaps because, at age 45, I find myself occasionally defensive towards those who think there must certainly be something very sad and wrong with me for roaming around the world. The fact is, I have a curious mind that needs constant stimulation and travel provides that. Your blog is great. Look forward to reading more. Thanks, Laura! 🙂 I definitely understand that curiosity that drives us to move and travel! I’m re-reading The Lord of the Rings at the moment, and there’s a Treebeard quote I’ve always loved: “Things will go as they will, and there is no need to hurry to meet them.” It’s not necessarily a travel quote, although I’ve been mindful of it when I’ve been wishing away my life waiting for a big trip, but it’s generally excellent advice. It’s a great reminder to be present, and not to rush so fast towards your future that you forget about the present. You have several I love or relate to. The one about food and cheer, so true how many people have i met over a meal from all over the world! The one “little by little….I find when i read blogs like your wonderful one that i know so little about the world and get excited following on adventures. The “Don’t adventures have an end….” Well not really in an ever changing world! I am so glad there are people like you to explore it! I am glad to see you are careful too. 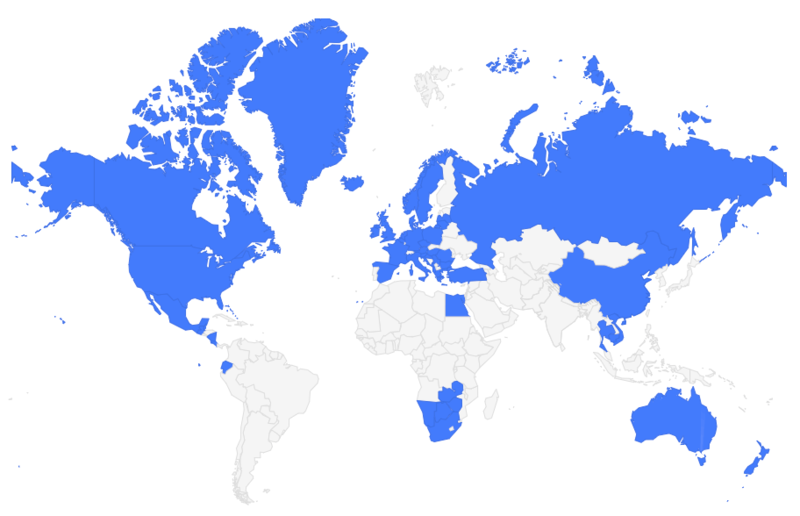 Some parts of the world are not quite ready to be explored because the “adventure” is way too risky! Which brings me the “The world is indeed full of peril…” strange as it may seem, but i totally relate to that! I look forward to the day the risky places become “fair” again ! And all people everywhere can enjoy places without fear or losing their heads so to speak! Be safe and keep blogging looking forward to your next post! Thanks for the great comment, Rebecca! I’m glad that you can relate to some of these, too. These are great quotes. I’m not a Tolkien fan, so am not familiar with them, but they certainly ring true. Especially the one about all who wander are not lost. I’ve always wondered where the title of your blog came from. I think it’s actually the quote I liked most in the ones you shared. Good choice! Yeah it’s really one of my favorite quotes! When I first named my blog, I wasn’t sure about it. But now I’m so glad I went with it! One of my favorites is the quote that inspired my own travel blog! Tolkien sure has got this travel inspiration thing figured out :). Great post! Wonderful quotes, loved reading them! If I had to pick a favorite, it would be – If more of us valued cheer and song above hoarded gold, then it would be a merrier world! – So true!! Yup, that one is so true, and always relevant! Wow, I thought I was a Tolkien nerd, but you’ve put me to shame! An Elvish tattoo, eh?! I may be a little jealous. I love the quote about fencing the world out because it works on so many levels. Being open to diversity in the world around us can be a source of strength, but so many people resist it. Damn, now I need to go back and read The Lord of the Rings! Plus it’s fun saying, I’ve been there! Or, I know where that is! whenever a place you visited comes on TV or in the movies. Since Viking River Cruises features the Hungarian Parliamentary Building in their commercials, I’ve found myself saying “Budapest!” when it comes up. This post has swept me, my mind and spirit. Very inspiring post! I have my moments there. Thank you for sharing! My pleasure, Vanessa! 🙂 I had fun writing this one. So, don’t judge me, but I haven’t watched Lord of the Rings in years! I was house sitting this weekend, tho’ and sat and watched all three films in a row! I still prefer Harry Potter, tho’! Who are your other favourite authors? As far as movies go, I like “Lord of the Rings” way better than the Harry Potter films. BUT, I think I like the Harry Potter books better – Tolkien isn’t exactly “easy” reading. Haha. Other favorite authors… hmm, well definitely JK Rowling! And then I have other favorite books by a handful of different authors. My favorite book at the moment is “The Historian” by Elizabeth Kostova. I love Tolkien as all British kids of my generation did LOL! One of my favourite quote is “I travel not to go anywhere, but to go. I travel for travel’s sake” from Robert Louis Stevenson and “Freedom is a noble thing” but I don’t know who wrote that. I’d say that was most important to me “freedom” to live the life that I want to live and the privelage I have because I am able to do so. Those are both great quotes, too! Agreed. I love how you can learn a lot from these. My favorite is “If more of us valued food and cheer and song above hoarded gold, it would be a merrier world.” – It teaches us that the most important things in life are the simplest things. I’m a bit embarrassed to say that I had to look up who J.R.R. TOLKIEN was. Now that I look like an idiot and wishing I had stayed awake during literature class…I understand. Haha, no need to be embarrassed! I realize not everyone is as big a nerd as me. 😉 Hopefully even if you don’t know him you can still appreciate the quotes, though! So many great quotes that it’s hard to choose a favourite one, though I’m quite taken with “Not all those who wander are lost”. I am definitely thinking about getting lost on purpose to actually find myself. I absolutely love this article! I love J.R.R. Tolkien and really anything he ever said, but since I do a travel blog too this is inspirational for me even more. Your blog name is about the best there is. I have looked on your blog several times before but don’t see how I missed this! We are all travelers, whether we go abroad or not. I have been fortunate enough to visit the UK (including Tolkien’s grave), but my finances do not permit me to travel abroad as I would like, but I have learned a truth about travel that Bilbo learned in his old age. Stand in one place long enough, and you will still find you were not where you used to be, even though you never left. The world is always changing, and one can find a new world to explore where the old one used to be. Also a very good and truthful quote. Well, we must remember if our ancestors didn’t go “On an Adventure”, we might have become extinct by being in the middle of food chain. I liked Thorin’s last quote and especially his transformation from a corrupt king to the son of Durin. Wish there was a place like middle earth, small enough to travel on foot (in few months maybe) but full of wonders. Merry Christmas to all, maybe Santa Claus is on an adventure now. I enjoyed reading the quotes and your interpretation of them, very cool. My favorite quote is “The wide world is all about you: you can fence yourselves in, but you cannot forever fence it out”. I like this quote because in my understanding he is saying that we are projecting our world from our inner self, then the world mirrors back to us a world that match our vibration. In my understanding he is taking about the holographic Universe and the law of attraction. oh my goodness, I was going to compliment you on the name of your blog (I almost chose a Tolkien inspired name for my blog too) when I spotted this excellent post! Honestly, well done! I’ve started a travel blog and yours is inspiring! I always worry that there are too many out there–but each has something unique to offer. The thing about blogging is that each blogger has their own unique voice and perspective – so I don’t think we ever need to look at one another as competitors! Thanks very much, Wayne! I’ve pretty much read everything Tolkien wrote about Middle Earth, but certain stories were definitely easier to get through than others. 😉 Glad you happened upon my post!